Debbie is a mother of adult children and a grandmother. She has been in primary teaching for many years and her roles have included special needs teacher and headteacher. Her experience and findings across all schools led her to specialise in the teaching of literacy and phonics teacher-training and consultancy. 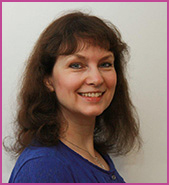 In 2007, Debbie wrote a systematic synthetic phonics programme available online, Phonics International, for all ages. She was then invited to be the phonics consultant for the Oxford Reading Tree Floppy’s Phonics Sounds and Letters programme and to work in association with Oxford University Press for teacher-training in the ORT Floppy’s Phonics Sounds and Letters programme. With a special interest in the early years, Abi and Rachel have been highly influential in the development of the Phonics International Early Years Starter Package and Teeny Reading Seeds resources. In 2013, it was decided to create a new website especially for pre-schoolers, hence this Phonics International for Pre-School site. The site will always be considered 'in development' and we very much welcome your questions, feedback and collaboration. Please note: The Early Years Starter Package is also suitable for older learners especially when English is an additional or new language or when learners have many gaps in their alphabetic code knowledge and decoding and encoding skills. Abi, Rachel and Debbie all provide teacher-training and talks in the synthetic phonics teaching principles both in the UK and internationally.